We will take a quick look at the Rafael Nadal Biography and then try to break down his game in detail. Born in 1986 in Manacor Spain, Nadal has been a tennis phenom from a very young age! He started playing at age four and it was obvious early on that he had what it takes. There are several great sportsmen in his family. His uncle Miguel Angel Nadal played for F.C. Barcelona. At the age of 15, Rafael Nadal already won his first match on the ATP Tour and one year later he became Newcomer of the year on the tour! Since then he has been almost unstoppable. He currently owns 9 grand slam titles and is one of only three players in the history of the sport to hold the so-called golden slam. (Winner of all four majors as well as an Olympic Gold medal in singles) It is also worth noting that Nadal has only had one coach in his career, his uncle Toni! After looking at the Rafael Nadal Biography, let’s try to break down his game in detail and find out what makes him so incredibly tough to beat. His speed and footwork in general were already very impressive at this age! People have talked a lot about Nadal?s technique and whether or not it is one of his strengths. Let’s take a look at every stroke in detail. Rafael Nadal has one of the best forehands in the game! People argue a lot about whether or not his technique can or should be copied, but no one argues how strong the shot really is. The spin rates he generates are simply in a different league compared to the other guys. I read something of roughly 5000 rpm compared to an average of about 3000 rpm for other male players. His ball jumps about as much as some of the best kick serves out there! Unless you are on the way to becoming a male professional player and already have a grip like that I would certainly recommend that you stay away from extreme forehand grips! Rafael Nadal is also one of the few players that hit their forehands with a straight arm! It has to be seen whether or not this is a new trend developing on the pro tour. Again I would not suggest anybody try to copy this though. His swing pattern is solid, his racket moves high-low-high and inside-out. He also uses the reverse forehand finish a lot for extreme topspin. Check out Nadal hitting forehands at a young age! You can already see the wonders of the kinetic chain in action. He uses all of the important body segments, coiling and uncoiling them one after the other which results in tremendous acceleration of the racket. Overall Nadal has a great forehand that really suits his game plan well. Nadal has had some severe ups and downs with his backhand throughout his career! At times he hits his backhand super aggressive and almost never slices the ball and then at other times he misses a lot with the backhand and slices a lot! Generally he has sound technique with a great inside-out swing pattern. He uses his body well to generate power and at this time of his career he also has the confidence to go for a winner with his backhand at just about any time from any position on the court. He does have a slightly extreme grip with his right hand, which makes it more difficult for him to get good depth on his shots. How well and aggressive Nadal hits his backhand is one of the most important factors regarding his form at any given time in my opinion. Whenever he feels confident with the backhand and goes for big shots his opponents are in big trouble because now they don’t know which side to go to at all. Whenever he is not hitting his backhand well he tends to slice a lot and this is when opponents usually manage to put him under a lot of pressure! Now Nadal has started using the slice backhand a bit more recently, especially from defensive position. From a technical standpoint this is not a very good shot in my opinion. It starts with a grip that leaves the racket face too open. This causes him to chop down on the ball too much. His balls tend to have too much sidespin and float in the air. The main reason he does not get in trouble more when he hits this shot is that he moves so well to the next ball! He’s probably trying to work on it yet unless he changes his grip he will have a very hard time improving it I believe! Rafael Nadal is not known for his net game and he probably knows that he will never be a great net player. Again his grips are problematic in my opinion. He keeps a strong forehand grip which allows him to hit decent forehand volleys but make the backhand volley very tough. His racket face is quite open when he hits the backhand volley and he needs to compensate with his wrist or by chopping down like on the slice to get the ball in the court. Nevertheless he has improved his volleys to the extent that he can finish points at the net which is all he really needs considering how strong the rest of his game is! Now again Rafael Nadal has really improved this stroke over the years. Very few professional players are even willing to work on their technique at all and yet I just recently heard that Nadal made a slight grip change on his serve. When he was a junior and early in his professional career, Rafael mainly used the serve to start the point and maybe gain a slight edge. Nowadays he has improved his serve to the point where he can go for aces and service winners a lot more. Up until somewhere in 2010 I believe he had a problem with his hitting arm being too straight and too high at the end of the backswing. Apparently he worked with a Spanish coach named Oscar Barros on improving this. 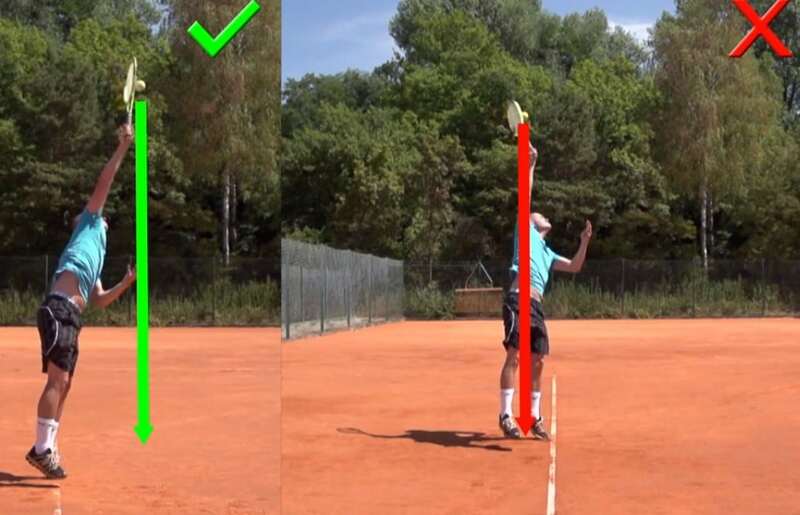 In recent years Nadal has developed a nice service motion! It is very fluid, he has good separation of his shoulders and hips, pronates his forearm well and generally has a good swing plane. His arm used to be a bit too stiff and he didn’t bend it early enough but it seems like he has fixed that problem as well. Actually, I believe that he is just now realizing how good his serve actually is and he will probably use it more as a weapon in the next few years! I believe that Rafael Nadal generally plays a smart tactical game. His game plan is built around using his forehand as much as possible. In the past he has used his first serve mainly to set himself up to hit as many forehands as possible on the next shot. Nowadays he also goes for his serve more but the general game plan stays the same. He hurts a lot of his opponents by drawing them outside of the court with his cross-court forehands to their backhands. One-handed players have a very hard time against this tactic because his balls jump up so high. I think that Rafael Nadal sometimes gets himself in trouble on faster hard-courts by playing with too much topspin. The few matches that he looses are usually the ones where an opponent really takes it to him and attacks his balls with flat powerful shots. When this happens Nadal continues to hit his loopy topspin shots a lot of the time instead of trying to be a bit more aggressive himself and flatten out his forehand a little bit. Not much to be said here except for that Nadal is a phenomenal athlete. Many of his peers have described him as superhuman. His speed, agility and explosiveness are probably the best we have ever seen in the game of Tennis. Additionally, he never seems to get tired. The only thing that has been holding him back is a few injuries that his physical style of play might have caused. Nadal doing one of his many fitness workouts! Physical and mental toughness usually go hand in hand in Tennis. Rafael Nadal certainly has both. He intimidates his opponents with his willpower and his fighting spirit. On the court he appears like a gladiator. No matter what the score, Nadal seems to play every point like it is a matter of life or death. I am not sure if there ever was a player with more mental toughness than Rafael Nadal! The difficult part when ranking Rafael Nadal was to decide whether his physical or mental toughness are his biggest strength. I decided on the physical aspect because the gap between how well he moves and how well his opponents move is bigger in my opinion than the gap between him and the others on the mental toughness side of things. It was a very close decision though! Nadal is continually improving his game already. 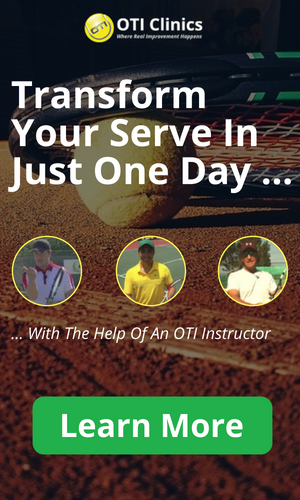 He is one of the few Professional Tennis Players that does not seem to be afraid to work on his technique and generally change his game. The one thing that I believe is key for Nadal to stay at the top of the game is to play aggressive enough and take control of the rallies. The few matches that he looses are usually the ones where he does not manage to get on offense during the rallies. I think he would be well-advised to flatten out his forehand more often. He is capable of doing it but does not do it often enough. So that was it for the Rafael Nadal Biography as well as his game analysis!